If you like defense, friday night’s contest between the MAAC defending champion and NCAA tournament participant, Monmouth University Hawks was 70 minutes of fan ecstasy. Both defenses were excellent as Monmouth employed a series of eclectic defensive schemes to thwart the Lafayette transition game while the Lafayette back line showed their mettle turning back the Monmouth front line attack. 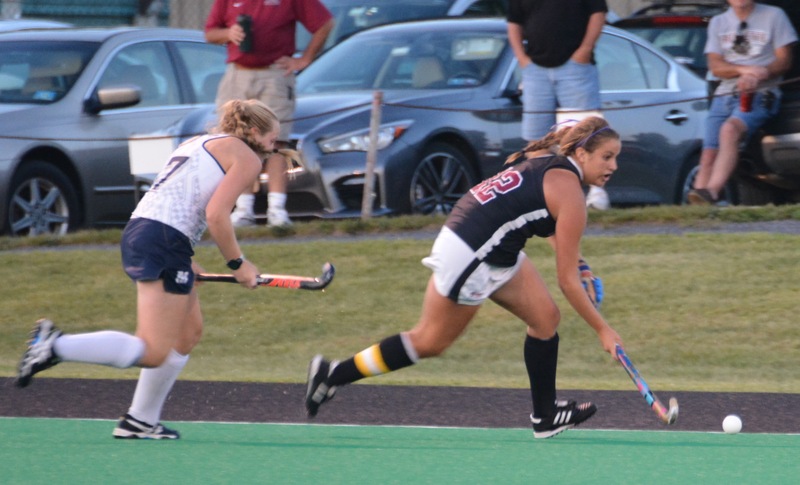 Although Monmouth got off more shots and corners ( oddly Lafayette did not get a single corner the whole game) the Lafayette back line including goalie Katelyn Arnold turned away threat after threat. 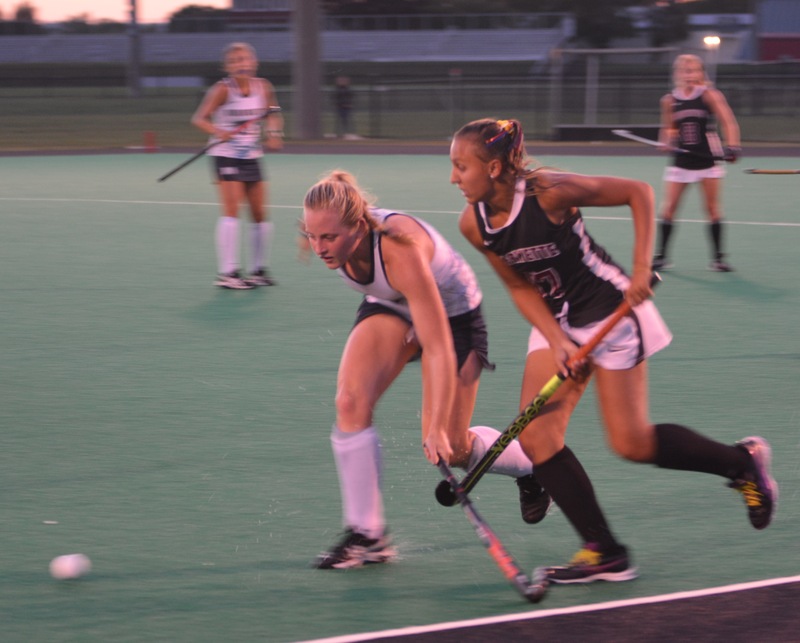 Ironically, the Leopards had their best chance two minutes into the second period on a penalty stroke which was blocked by the Monmouth goalie. The game was full of fan tension for those 70 minutes which was played like an eleven v eleven overtime for the last 10 minutes knowing that one goal could be the difference. As overtime came. for most of us who know this team well. it was almost a relief believing that Lafayette’s front line with its speed, skill, and the space created by the 7 v 7 format would serve as an advantage the Leopards didn’t have in the first 70 minutes. That advantage was to manifest itself with the Colbourne to Birle combination two minutes into the period.Ellen Colbourne received the ball at midfield dodged the first player and put her speed to work up the right sideline. Meanwhile Katie Birle deftly positioned herself between two Monmouth players knowing Colbourne would spot her.Ellen Colbourne wound up delivering to Birle who expertly redirected the ball between the legs of the Monmouth goalie. 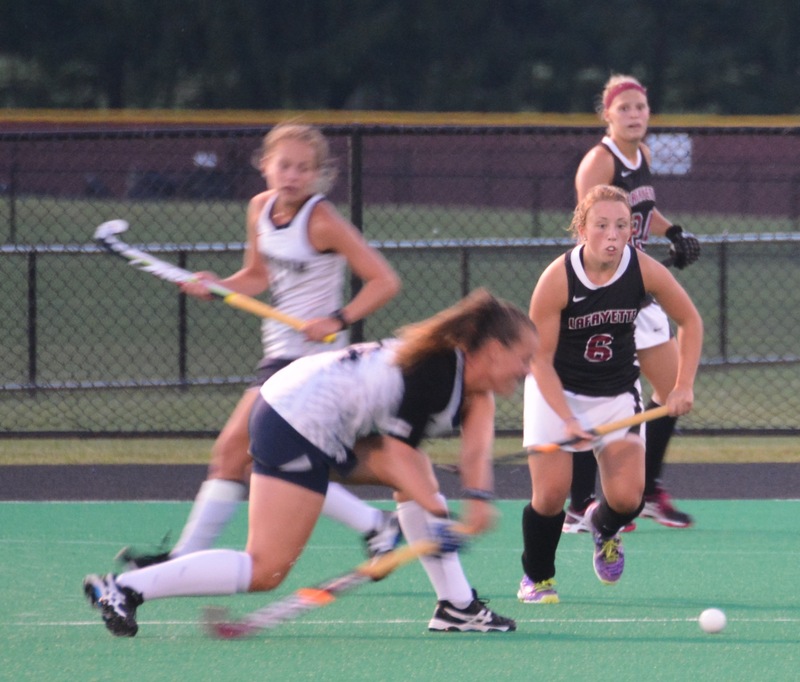 This was Katie Birle’s fifth goal of the season and none could have been more timely. Before last night, she was ranked 11th nationally in goals scored and is now the leading goal scorer in the Patriot League. 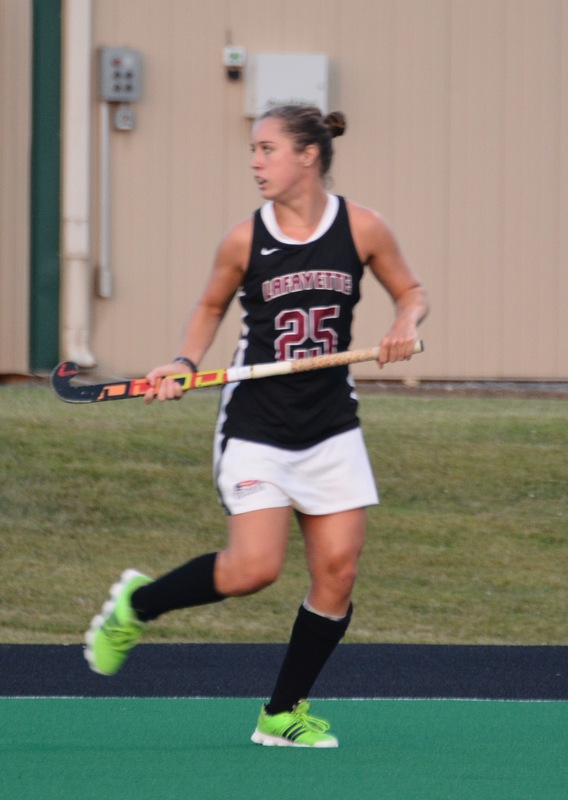 Colbourne’s assists puts her among the leaders in the league in assists as well. The Leopards are now 11-1 against the Monmouth Hawks who played with great intensity and heart. The Hawks were to step up before the game as a defective CD of the national anthem was to disallow the usual pre game recording. One of the Hawks was to come forward and deliver a beautiful a cappella version on the spot. Well done. I wish I had recorded her name but kudos to her in any case. This was goalie Katelyn Arnold’s second collegiate shutout of her career as she was perfect in the cage. The Leopards continue their home stand against another MAAC rival, Qunnipiac as they will be looking for revenge from last year’s overtime victory by Lafayette. The Leopards are now undefeated at home having suffered their only loss last week against highly regarded Liberty University last week in Virginia . Tonight’s 1-0 victory was their second overtime win having beaten Longwood last week 4-3. It is also their third one goal victory this season. Next week the Leopards will open the Patriot League schedule in Boston, against Boston University on saturday and will move on to play national champion UConn the following day before returning to Easton to meeting the national runner up Albany. Addendum: I just received an email from one of my readers. The young lady who so skillfully sung the national anthem was number 7 Mallory Kusakavitch from Pittston,Pa and Holy Redemer HS. She is a sophomore defender. Obviously a young woman of many talents….well done! !